Mat Pahmeier is an EdgeUp Advisory located in Sandborn, Indiana. Mat received a degree in Aviation Flight Technology from Vincennes University. During college, Mat discovered his true passion for agriculture while flying over fields. 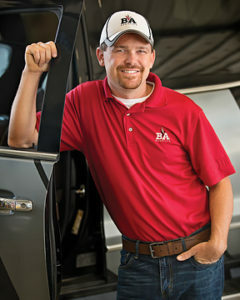 Mat’s passion prompted him to take additional courses in agriculture, which ultimately lead him to his current position at B & A.
Mat lives on his family farm with his wife, Brittany, and two children, Emerson and Baylor. In his free time, Mat enjoys being outdoors and spending time with his family.